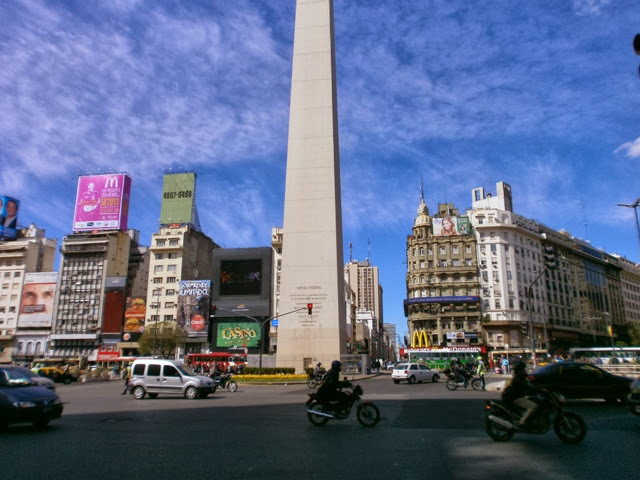 I had heard and read so much about Buenos Airies and had wanted to go there for many years. I could barely sleep the night before because I was just so excited. I really hoped it was going to meet my expectations. We arrived from Rosario nice and early from our four house bus ride. When we arrived to our hostel called American del sur, we realised that is was more of a hotel rather than a hostel. It was awesome. We signed up straight away for the Asado (BBQ) they were holding that night. We caught up with our friend CJ from Mendoza and headed down to Puerto Madero in the search of Choripans. 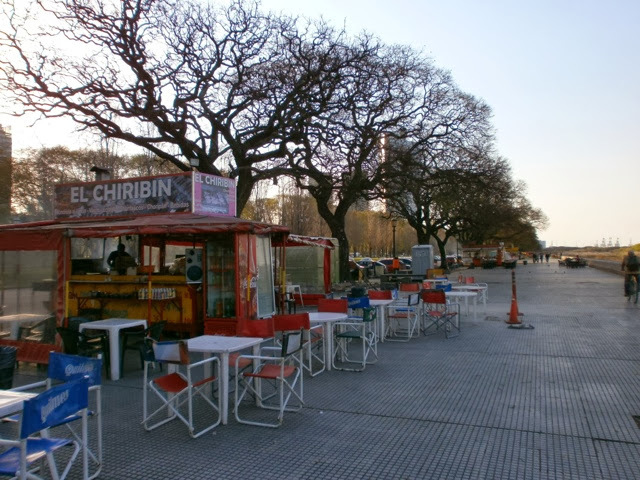 Buenos Airies consists of lots of different neighbourhoods which have a lot of rivalry against each other and pride themselves in what they are known for. 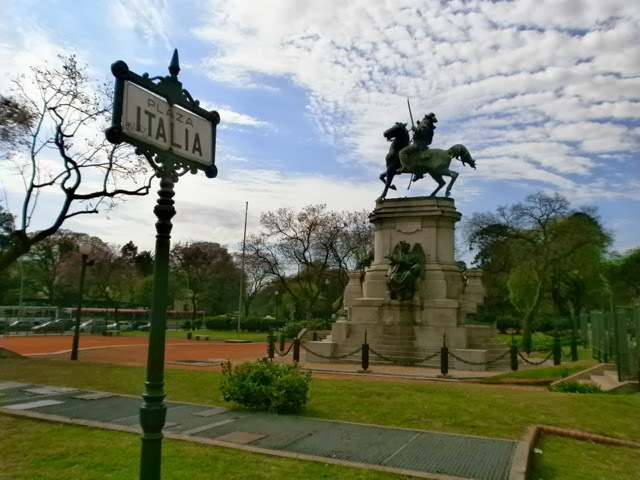 Puerto Madero is the most modern neighbourhood and one of the most rich. It also has the port where all the boats come in and out. 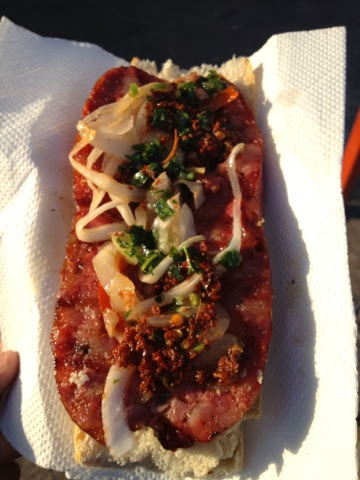 We went to the river front where there were hundreds of different stalls selling super panchos (hot dogs) and Choripans. We purchased a choripan and walked through the park and chatted until CJ had to get a cab to the airport to get his flight to Brazil. It was a really nice afternoon and a good welcome to Buenos Airies. 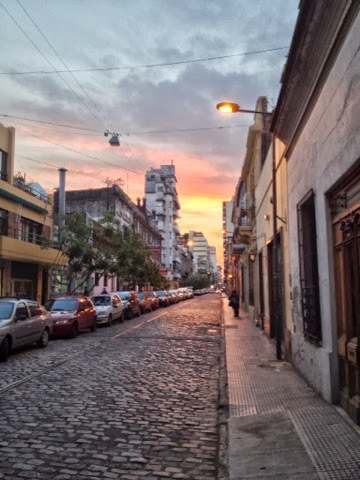 Afterwards, Tom and I strolled back to our hostel which was in the neighbourhood of San Telmo ( the oldest neighbourhood dating back to the 1800’s) and managed to witness a magnificent sunset. The next day we had managed to get into one of the top 5 tattoo studios in Bueno Airies due to someone else cancelling. The tattoo studio was in the area of Palermo Soho which is also an expensive area filled with lots of bars and clubs. In true South American style our 12 o’clock appointments turned into 2 o’clock and we didn’t get out of there until about 3:30pm. By this stage it was pouring with rain so we quickly found a place to keep dry and get some lunch. We hung around the streets until 9pm when we went into a bar to watch the UFC Tom had been dying to watch (boring!) A few bottles of wine and some Nachos later, I was quite content. We didn’t get back to our hostel til about 2am. It was a long, but fun day and boy did my tattoo hurt! Tattoo number nine. 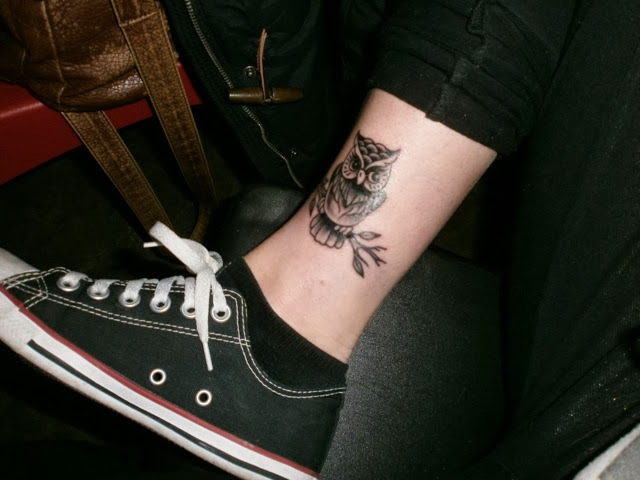 An owl on the inside of my ankle. 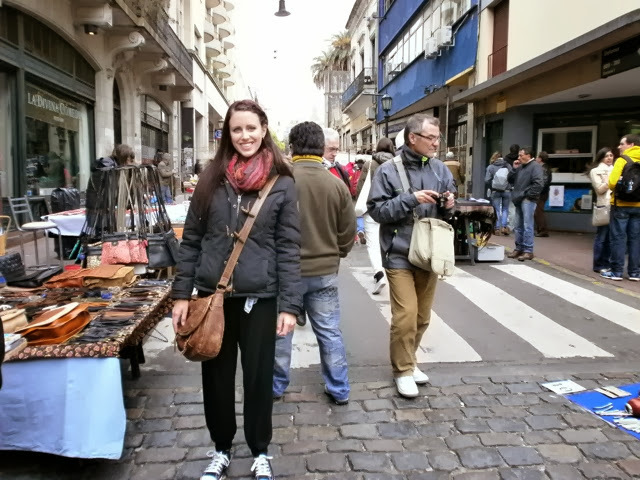 The next day was Sunday which meant the famous markets in San Telmo. We headed down to Calle Defensa which was shut off from traffic and stretched for at least 20 blocks full of market stalls. There was street performers, food, jewellery, clothes, shoes, scarves, ornaments, trinkets of all kinds and anything else you could possibly imagine. It was extremely packed with people and you could hear English being spoken all over the place, it was a tourists dream. Hands down the best markets I have been to, there was just such a good vibe there. That night we went to a Parrilla we had seen on Bizarre foods ( if you haven’t seen that show watch it…now) called La Brigada. It was really amazing service and delicious food. 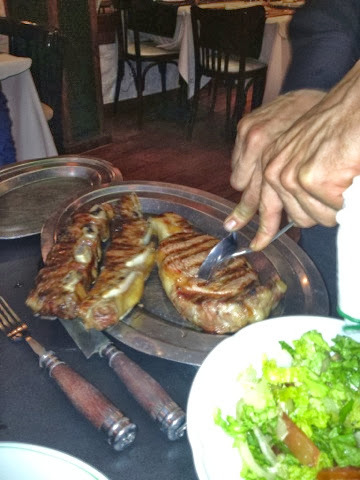 The waiter even cut our steak with a spoon, that’s how tender it was. We got a little shock when we got our bill which was $500 pesos which is about $100 Australian. 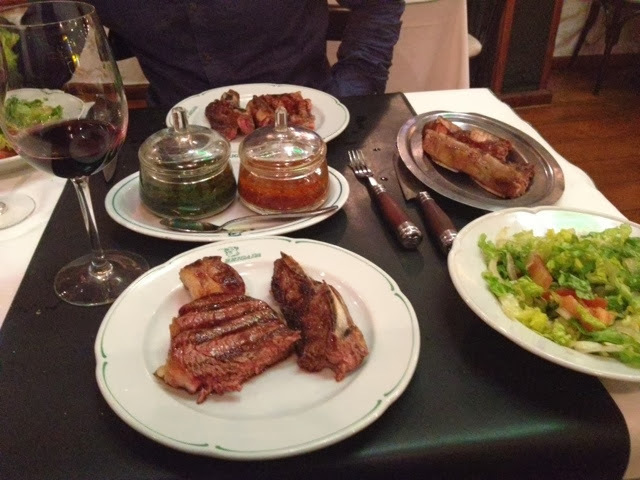 We really are the worst backpackers ever sometimes, but hey it’s not everyday you get to have amazing wine and Argentinian beef. Our waiter cutting the steak with a spoon. The next day involved us walking around the city centre which is known as the Mirco Centre. It was filled with shops and shopping malls but was insanely busy and people pushing left, right and centre. It was also filled with lots of people shouting “cambio, cambio” wanting to change US Dollars for pesos. 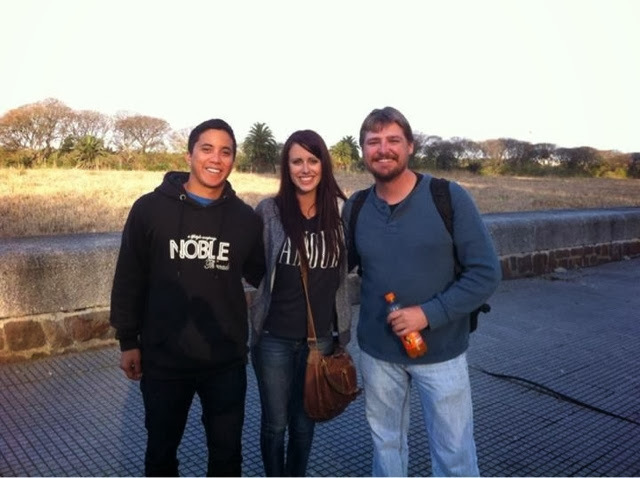 We walked to the Monument called the Oblesico which was nice. We even got to see a brief tango show in the streets. The city centre is nice, but gets a bit much after a while with all the traffic and the pushing and shoving. 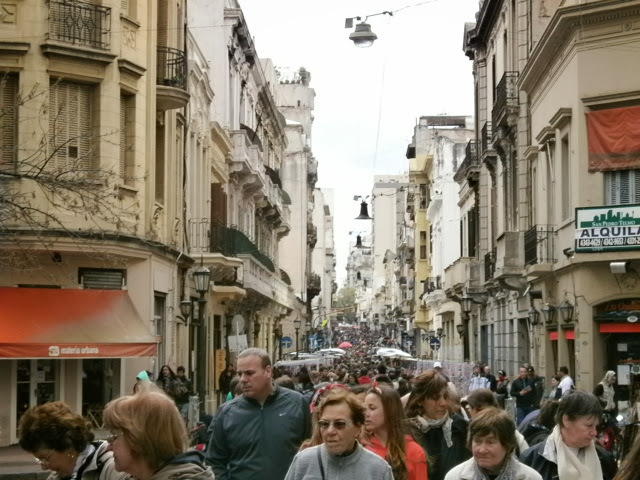 It was nice to head back to our nice little area of San Telmo. 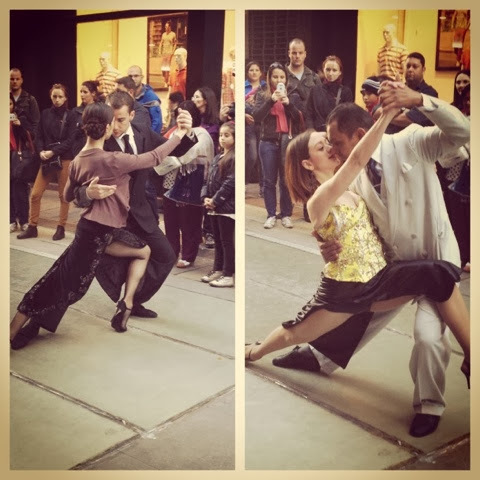 Tango show in the streets. I’ve fallen completely and utterly, head over heels in love with Buenos Airies 🙂 I can’t wait for what the next two weeks has install for us!